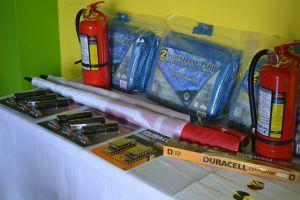 On Thursday, October 9th 2014, Projects Abroad Jamaica honored residents from the Manchester and St. Elizabeth communities for their participation in Operation Get Ready. The Operation Get Ready competition was launched on July 3rd 2014. It aims to get residents in vulnerable communities ready for the hurricane season and other natural disasters. Projects Abroad Jamaica offers a Disaster Management Project which facilitates individuals from across the world, instilling vital town planning and disaster management skills in Jamaican communities. In keeping with this mandate, the ‘Operation Get Ready’ disaster management campaign was set up to assist vulnerable communities with their preparations for hurricane season. The aim is to decrease the damaging effects of hurricanes and other natural disasters and build climate change awareness. 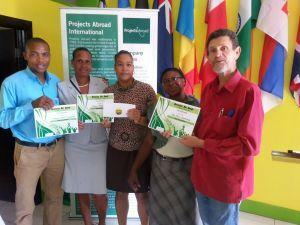 A total of eleven communities took part, with all groups being awarded a certificate of participation. The New River community in St. Elizabeth won first place while Treasure Beach and Alligator Pond were awarded second and third place respectively. The winner received $80,000.00 worth of disaster supplies, while the first and second runners up were awarded $50,000.00 and $20,000.00 worth of equipment. Over a three month period the participants were challenged to get their communities ready for this year’s hurricane season. The residents engaged in activities such as drain cleaning, the construction of trenches, tree pruning, solid waste management, and shelter management. They also participated in climate change and disaster management workshops, hurricane drills and simulations, as well as first aid and CPR training. Volunteers visited the communities once every two to three weeks to conduct follow-up assessments and to monitor the work being done. They also conducted disaster management workshops with community leaders. New River representative, Kinsley Clarke, commended Projects Abroad Jamaica for the ‘Operation Get Ready’ initiative, explaining that it was a very timely project which he hopes will have longevity. “We need to get more agencies on board to participate in this activity,” he stressed, while also emphasizing the awareness it brought to the community and thanking Jamaica Country Director, Dr. Bridgette Barrett, for her persistency and insight. Initiatives such as Operation Get Ready will ensure that when disaster strikes, the local community is well-prepared to handle it. 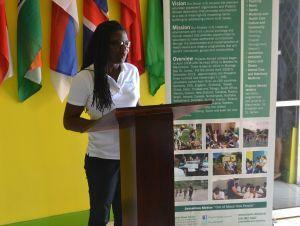 Read more about Disaster Management in Jamaica.